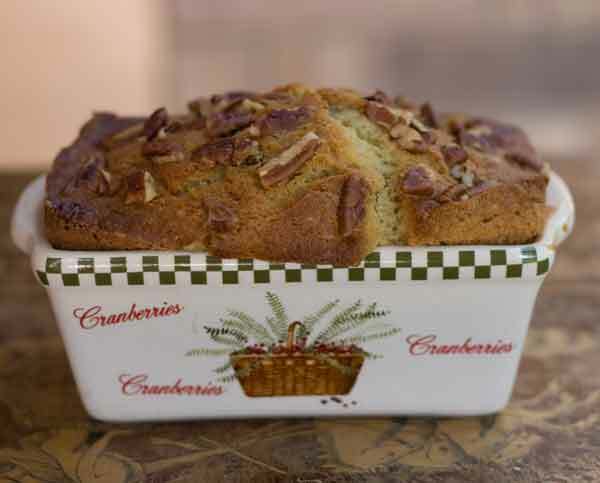 Dense and moist banana nut bread recipe from my friend Martha's friend Terri's mom. In a large mixing bowl using an electric mixer, beat the butter and both sugars until creamy. Beat in the vanilla. Add the eggs one at a time, beating until mixed. Beat in the milk, baking soda dissolved in water and the salt. When mixed, beat in the bananas, then stir in the flour. Stir in the pecans.